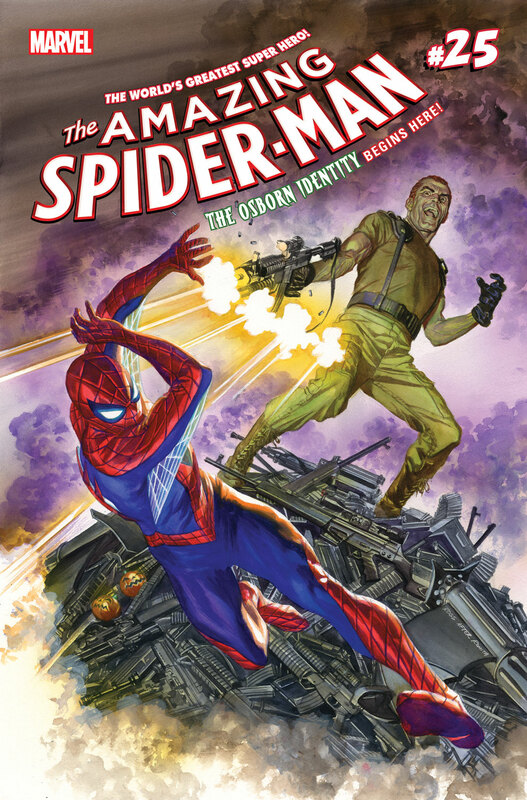 Fresh from the conclusion of the Clone Conspiracy, your friendly neighbourhood Spider-Man is leaping straight into a brand new story arc as Dan Slot and Stuart Immonen kick off “The Osborn Identity” in the massive 96-page Amazing Spider-Man #25, on sale next month from Marvel Comics. With Norman Osborn back and deadlier than ever, backed by a massive multinational corporation, does Peter Parker have what it takes to bring the fight to his old foe? The first chapter of the new story will comprise 40 pages of the oversized spectacular, with the remaining page count being filled with all manner of supplementary stories from a plethora of acclaimed artists. Hannah Blumenreich makes her Marvel debut, Cale Atkinson brings us the latest instalment of the A-May-Zing Spider Aunt, Christos Gage and Todd Nanuck bring back the villainous Clash, Jacob Chabot and Ray Anthony Height provide another Marvel Tsum Tsum tale, James Asmus and Tana Ford transport the webslinger to Shanghai, and Dan Slott and Giuseppe Camoncoli collaborate on a top secret story that promises to have fans everywhere talking! You can feast your eyes on some interior artwork below. Amazing Spider-Man goes on sale in print and digital on the 8th of March 2017.